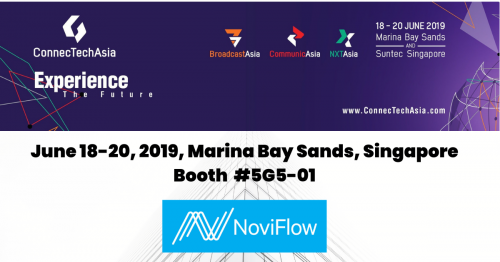 Once again, NoviFlow will be exhibiting at ConnecTech Asia June 18-20, 2019, at the Marina Bay Sands Exposition Centre in Singapore. We invite you to visit our biggest and busiest booth ever (#5G5-01) and see our new technology demos at Asia’s largest media and technology event. NoviFlow will be demonstrating live our NoviWare NOS on the world’s fastest networking chip, the Barefoot Tofino, running at 12.8 Tbps! To set up a meeting with NoviFlow please e-mail us at contact@noviflow.com.